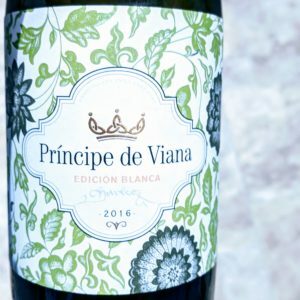 This Principe de Viana Edicion Blanca came in a mini selection box from Sipp wines. It was an introductory trial box which oddly had one white, one red and two sparking wines. I know it’s coming up to Christmas and all things are sparkly, but that seems an odd way to showcase wines. That said, I know I’m something of an oddity in not finding sparkling wines to be my absolute favourites. One of the sparkles was rose at least. Enough about he weird selections of marketing departments and on to the wine, well almost, one more positive shout out to Principe de Viana’s marketing department, I did like this label, it does a reasonable job of portraying positive expectations of a fresh and elegant wine without actually saying anything. It also reminds me I should probably schedule in some decorating for the new year. The wine itself is bright, clear and with a colour hovering somewhere on the lemon end of a spectrum between lemon and lime. It smells fresh, with lemons, limes and even grapefruit joining the nose party. It’s dry with a bright acidity, in the Goldilocks range. The flavour is clean, and those citrus fruits are joined by mango and pineapple. I’ve had a recent obsession with eating mango fingers lime squeezed on them. This wine does a reasonable job of delivering that taste profile in a liquid and alcoholic format. It’s a non standard fifty fifty blend of Sauvignon Blanc and Chardonnay, and I have to admit that if I’d seen a bottle with that blend on the shelf I’d have probably given t a miss, thinking it would be an odd hotch potch of left over grapes mashed together, but it really does work in a strawberries and black pepper or pineapple and chili kind of way. It’s from Navarra in northern Spain, a zone I still feel love for even though it’s over a decade since I cycled through it. I was impressed by this bottle, so I’m looking forward to trying the red it came with, but I don’t know if I’ll keep up a Sipp subscription. Deliveries of three or four bottles at a time seem like I’d be paying good wine money on excess shipping fees, and if half are sparkles, I’ll need to throw more parties to rid myself of them and that gets expensive.